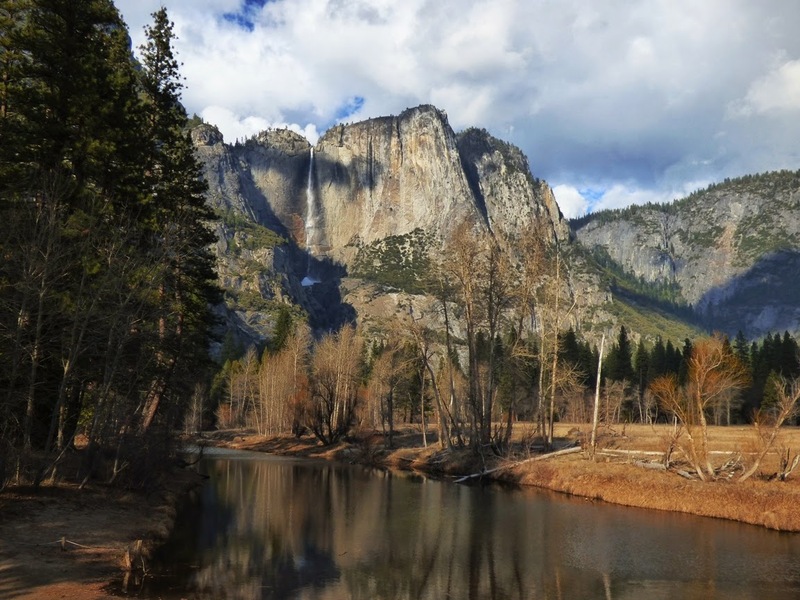 Is there a more beautiful place than this, the Ah-wah-nee, or the Yosemite as some chose to call it years ago? I'm sure that everyone who explores the outdoors has "that place", the spot that represents the highest attainment of their personal concept of beauty in nature. In my life so far, there is no place more beautiful than this. It isn't just the scenery, which of course is spectacular. It the privilege of coming back time after time, seeing the valley and park in all seasons and all conditions. I've driven through snowstorms, rainstorms, floods, and heatwaves to reach the valley, during every month of the year. I'm guessing I've made the journey 80 or 90 times in the quarter century that I've lived in the adjacent San Joaquin Valley. I've never had a disappointing trip. There is always something new, and there are the old familiar places as well. And much more remains to be explored. It's a rarely fulfilled desire, the dream to have the most beautiful place in the world to myself. It's just a little selfish too, but hey, I wasn't keeping anyone else from visiting that day. 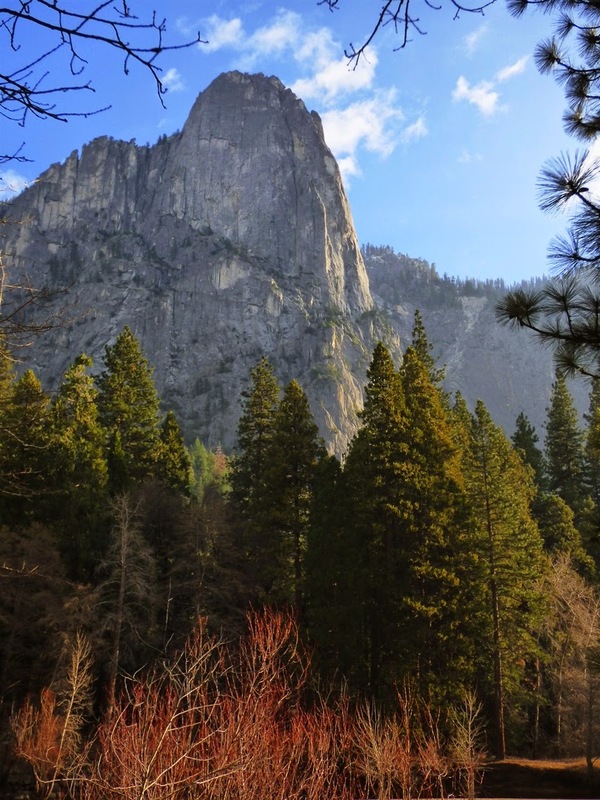 Most seasons it is quite hard to imagine Yosemite Valley as a wilderness. It hasn't been a wilderness for nearly two centuries. But on Sunday, here and there, it was possible to envision the wildness. 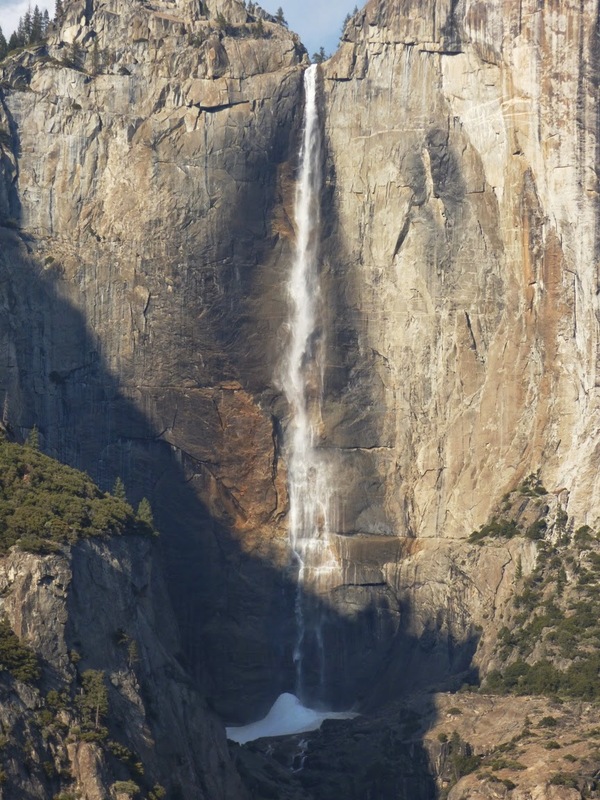 After a long dry spell, Yosemite Falls began to flow again a few weeks ago after our December storms. I hope we will have some more storms soon. After a record-setting December, January has been dry. How dry? Zilch, not a drop of rain in the San Joaquin Valley, and none in the 10 day forecast. It is a bit worrisome. Three years of record-setting drought, and this year has the makings of a fourth. We don't usually stop at the Swinging Bridge Picnic Area, as it is usually packed with people, but not Sunday. 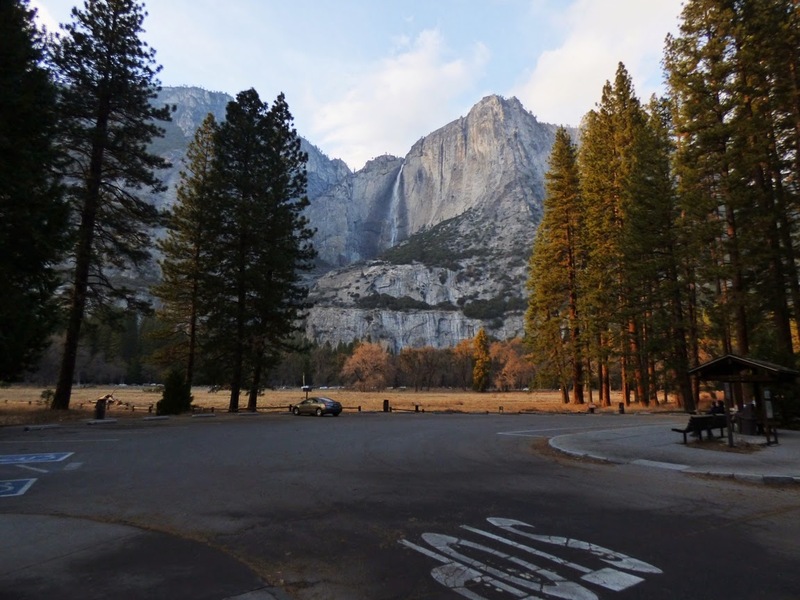 It offered wonderful views of Upper Yosemite Falls, and one of Yosemite's less familiar peaks, North Dome (above). 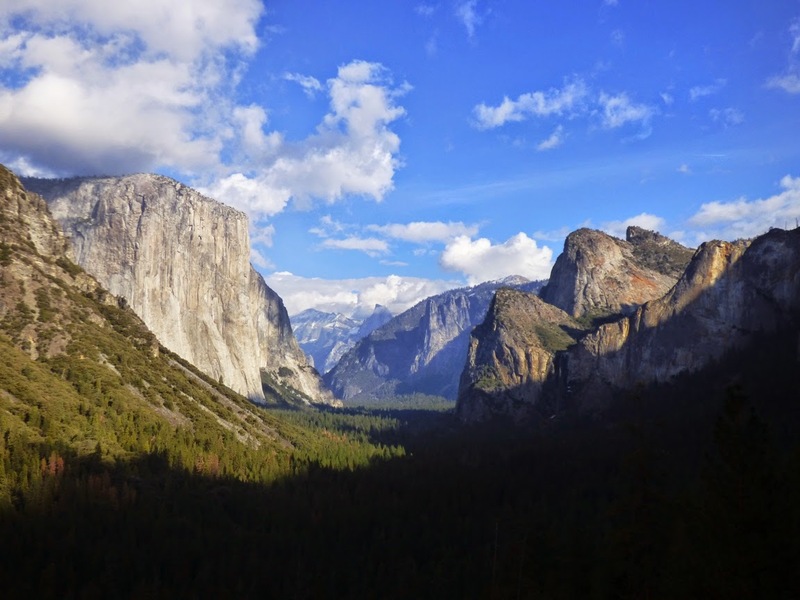 I'm pretty sure that if Half Dome didn't exist, or Yosemite Falls, or El Capitan, or Sentinel Rock, or Cathedral Rocks, well then, I am sure that North Dome would be one of the most famous landmarks in Yosemite Valley. Late in the day we found ourselves in the meadow below El Capitan looking for the free-climbers as they worked their way up the cliff. 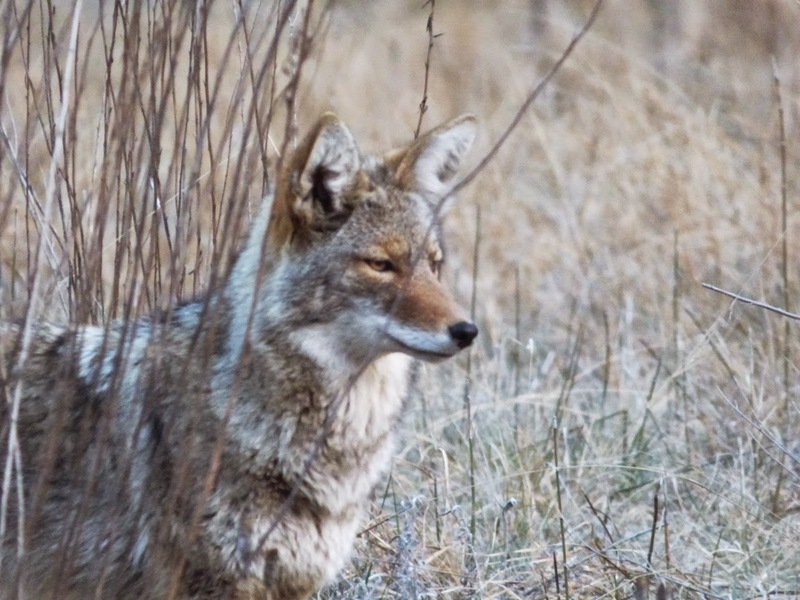 The few people who were still there were looking up so intently that it took a few moments for anyone to notice that a coyote was standing among us. I took a moment to look at the oft-ignored cliff across from El Capitan, the wall of spires between Cathedral Rocks and Sentinel Rock. 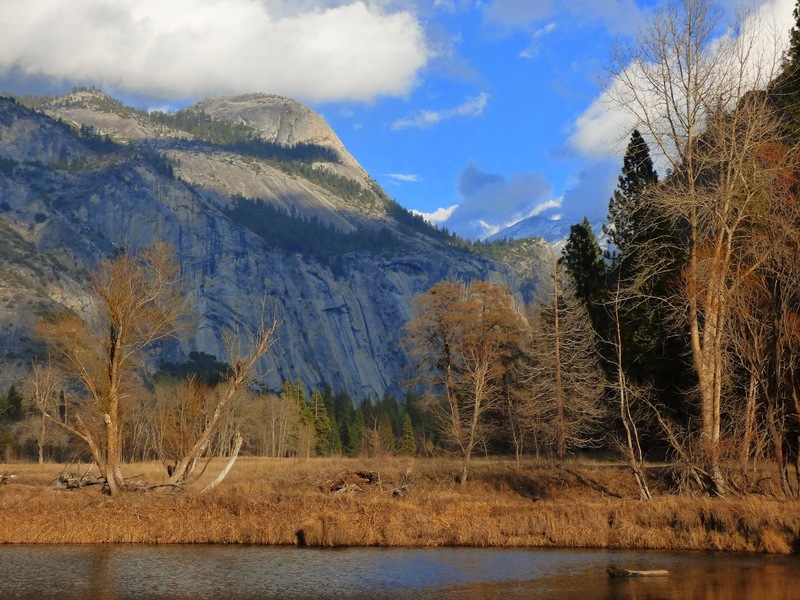 The names are less familiar to most park visitors, Crocker Point, Stanford Point, Taft Fissures, and again, in any other setting, these peaks and cliffs would be the focus of a national park, rather than the relatively unknown cliffs that they are. If the panorama shot below seems a bit less sharp, it's because it was done with my smart phone rather than my usual camera. It was a beautiful day in a beautiful place. I'm anxious to return. Where is your most beautiful place? It really is the most beautiful place on earth. 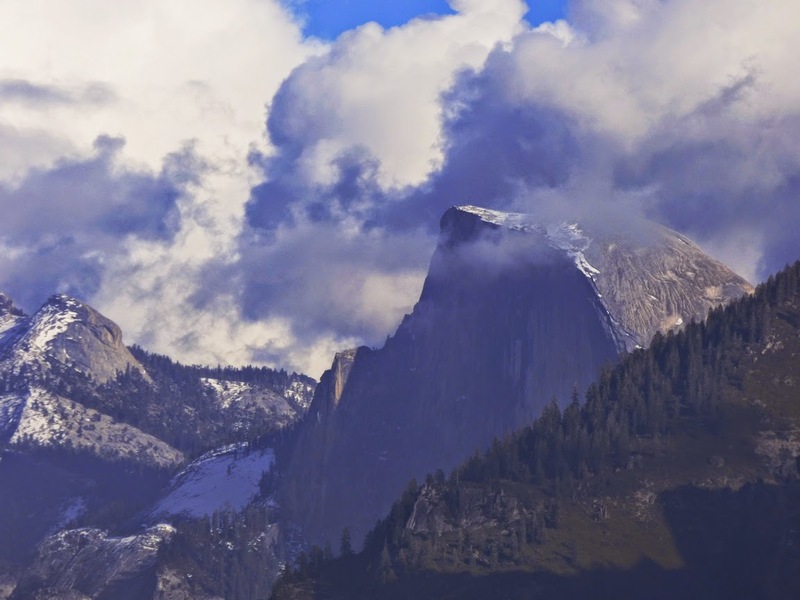 Thanks for the great photos -- I can't wait to visit Yosemite again. Thanks Hollis. Of course I'm actually the same way. In my teaching, whatever the subject, it's the most important in the world at that moment. My favorite places are like that. It's also like trying to answer which of your children you love more. I had a feeling that you were "actually the same way", I can sense it in your writing. I think that kind of passion is really valuable in teaching ... so good for you! We're fortunate enough to have received 0.7 inches of rain down my end of our fair valley on the 11th of January and I've finally experienced Tule fog. Driving across the southern Sierras on Saturday, however, reminded me how low Isabella Lake is and how little snow we've accumulated (just a little visible high on Owens Peak) thus far this winter.